This is a LIVE videogame experience where everyone gets to be a part of the action. 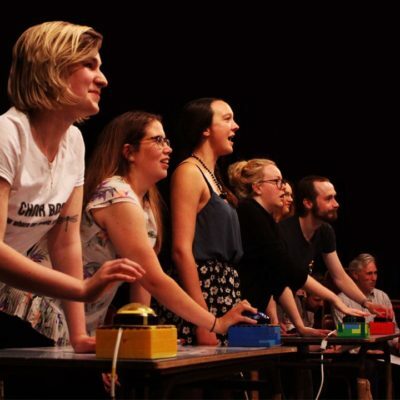 As eager audience members, you will have the chance to become human buttons, take on the Power Rangers, zap each other with barcode scanners, shout out loud and help your friends solve cryptic codes! Or sit back, and watch your friends literally become cogs in a hilarious machine. With games that spill out from the stage and into the audience, this show promises to be very physical and utterly unpredictable! Rising Ape are a science entertainment collective who create strange and immersive interactive experiences. Their latest show, The Audience, lets you take part in your own slice of Black Mirror-esque dystopian sci-fi and meet ALIX – the friendly courtroom AI of the future. In 2037, who should really be in charge of what’s right and wrong?